ABC's "This Week" —Mick Mulvaney, acting White House chief of staff; Sen. Amy Klobuchar, D-Minn.
JUNEAU, Alaska (AP) — Lt. Gov. Kevin Meyer was among the participants at a White House-hosted discussion on trade, the economy and workforce issues. Trump has declared a national emergency on the southern border and is using his executive authority to go around Congress and siphon money from other government accounts. AUGUSTA, Maine (AP) — Several members of Maine's congressional delegation have spoken out against President Donald Trump's plan to declare a national emergency to build a wall along the Mexico border. Republican U.S. Sen. Susan Collins says the declaration would "undermine the role of Congress and the appropriations process." She says the move is "of dubious constitutionality," and it will almost certainly meet a court challenge. President Donald Trump is dining with his top advisers as he remains in Washington during a partial government shutdown. Trump arrived at Vice President Mike Pence's residence at the Washington Naval Observatory on Friday evening. The White House says the incoming acting chief of staff, Mick Mulvaney, and senior adviser Jared Kushner are joining the pair. WASHINGTON (AP) — A top White House official signaled Sunday that President Donald Trump is willing to accept less money than he's been demanding to build a U.S.-Mexico border wall, but a senior congressional Democrat said that, while their own offer could be sweetened, they still will not agree to a wall. WASHINGTON (AP) — A White House official says tension between a president and the interest-rate setting Federal Reserve is "traditional as part of our system." 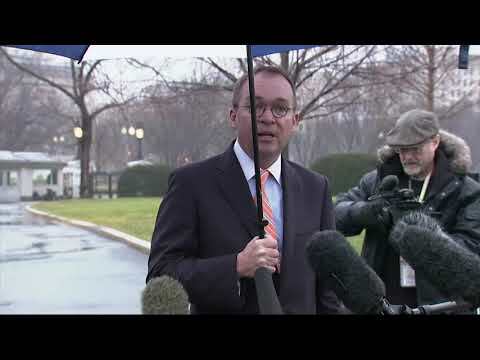 ABC's "This Week" — Mick Mulvaney, director of the Office of Management and Budget and incoming acting White House chief of staff; Sen. Jeff Merkley, D-Ore. The CFPB no longer wants to call itself the "Bureau of Consumer Financial Protection," a change that had been sought by Mick Mulvaney, President Trump's acting director of the bureau. The decision was announced in an email by new director Kathy Kraninger on Wednesday, who took over earlier this month. WASHINGTON (AP) — The new head of the U.S. consumer watchdog agency says she doesn't have immediate targets in mind for rolling back actions taken by her controversial predecessor, and will put protecting consumers in the forefront while also encouraging financial innovation.